Portland Mayor Ted Wheeler is pushing back on media accounts of the Patrick Kimmons protest march. 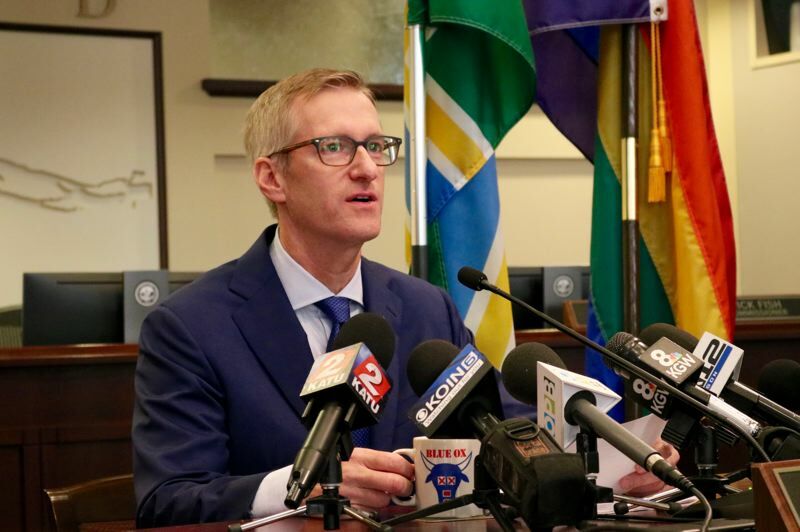 Portland Mayor Ted Wheeler is weaving his own narrative after conservative media reports zoomed in on a recent Black Lives Matter demonstration that pitted protesters against motorists. The Tribune's on-the-ground coverage and several videos captured the hurly-burly on Saturday, Oct. 6 after a 74-year-old motorist slowly piloted his car into a group of people marching in the street in response to a fatal police shooting. The brief incident spawned a trending Breitbart article headlined "Antifa Takes Over Portland" and an eight-minute Fox News segment deriding the mayor for his alleged lack of leadership. "C'mon, you've got to have some standards, and this place is now a loony bin over there because the mayor is a nutcase," pundit Jesse Watters said during a taping of The Five opinion show that was later posted online. "Ted Wheeler is incredibly unpopular," added Lisa Kennedy Montgomery, a commentator who grew up in Lake Oswego. During his monthly press conference, Wheeler said the authorities were well-aware of the "unacceptable behavior" occurring during the unpermitted protest march but thought that intervening would only escalate the situation. Wheeler also said he's no "nutcase mayor." "I am willing to take criticism all day long from Fox News, but I am not willing to accept criticism from Fox News of the men and women of the Portland Police Bureau," he said on Friday, Oct. 12. "It's not as easy as it may seem sitting in the basement with a beer, watching a Youtube video." The mayor also compared the situation to the unevenly-heated porridge portions featured in "Goldilocks and the Three Bears," explaining that police are either criticized for being too heavy-handed — or too standoffish. Wheeler says he was not in town on the day of the protest for Patrick Kimmons, who was killed by officers responding to a late-night shooting that wounded two others on Sept. 30. 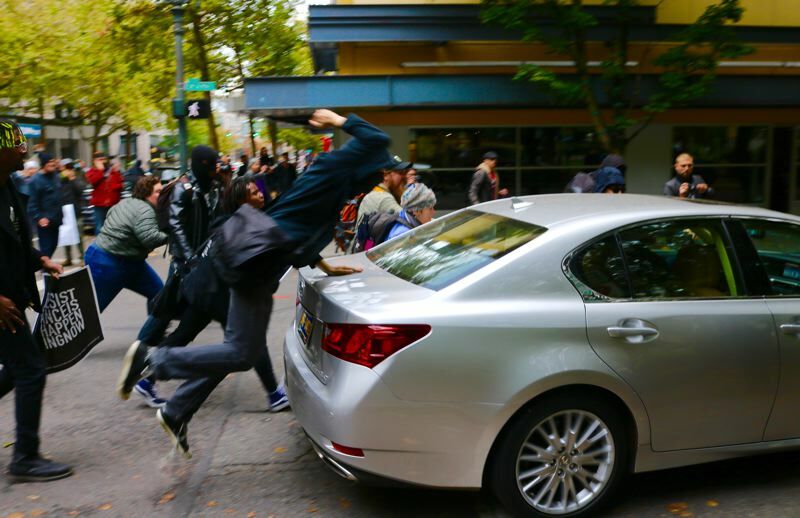 A Tribune reporter covered the march and was standing very close to the silver Lexus sedan as it turned off Fourth Avenue onto Salmon Street, ignoring protest organizers who were ahead of the column and unlawfully directing traffic. The driver of the Lexus first stopped his car on Fourth before inching forward into people's bodies. Several people immediately began to beat the vehicle and one person threw themselves onto its hood. The motorist, a local named Kent Houser, later told police they inflicted $3,000 in damage. As police commissioner, the mayor can hire or fire the police chief, provides high-level strategic guidance and must convince his four companions on the dais to approve the bureau's annual budget. Wheeler says he does not oversee the response to individual incidents.